Spontaneity, transparency and intense color are what fascinate Rob Greene about watercolor. His painting is characterized by strong forms, high contrasts and vivid colors. Much of his work is inspired by the rugged coast of Maine where he summers each year, with its combination of islands, sea, rock forms, and changing light. The WalIkill River, in New Paltz in all its seasons, is another favorite subject. 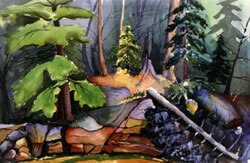 Although he prefers to explore watercolor independently, he has studied at the Woodstock School of Art and attended a number of Maine Coast workshops. Past local shows include the Gallery Frame Shop, Unison Arts, and the Springtown Gallery. Among his mentors and teachers are Staats Fasoldt, Carleton Plummer (of Maine) and Stephen Quiller of Colorado. They have encouraged him to find his own style and to take what he sees and make it into a personal statement.